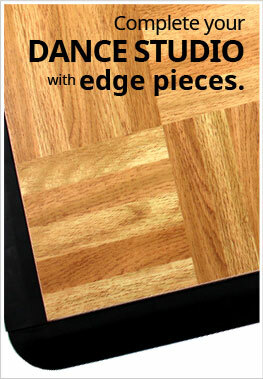 Description - Practice Dance Tiles are the perfect dance flooring solution for any young, aspiring dancer. These tiles can easily be setup in the home and you can purchase tile by tile, expanding to create the exact dance floor space that you need. Our Practice Dance Floor Tiles are durable, and can even be used as event flooring where many people will be standing or dance on them at a time. Whether you are setting up a small practice dance area in your basement, or putting together a portable temporary dance floor for events, you are sure to love these durable tiles. Rule of thumb: 9 sq ft per couple. 3' x 3' - Personal practice dance floor. 5' x 5' - Personal practice dance and aerobic floor. 8' x 8' - Dance floor and event floor for up to 8 couples. Recommended Uses - These Practice Dance Tiles are perfect for use in the home and are used to practice multiple dance styles, like tap, beginner ballet, flamenco, and more. These modular tiles are easy to setup and take down, making them easily portable and perfect for use as temporary flooring at events such as weddings, parties, and other events where a temporary dance flooring is needed. Vacuuming or sweeping any loose crumbs, dust, or debris from the Practice Dance Tiles when necessary. When installing the Grid-Loc tiles, we recommend starting in the front left corner of the room and working your way out from there. Note: Since our Practice Dance Tiles tiles feature a vinyl top adhered to the tile with a pressure sensitive adhesive, pressure may be needed to ensure that the vinyl top is fully adhered. You can easily accomplish this by walking across the floor or by using a flooring roller for larger areas. Great for the home or events. Makes a great gift for the dance enthusiast in your life. Our Practice Dance Tiles are a great solution for a practice dance flooring in the home and can be used for events such as weddings and more. These tiles feature an attractive wood look top surface that is sure to look great with any decor or theme. Add some edging and you've got your very own dance floor! By offering a single tile minimum order, you can create your own custom size and shape dance floor. These tiles easily interlock for a durable and reliable joint surface that can support most dance styles. Our Practice Dance Tiles are built to last, featuring a durable construction from top to bottom. Whether using these tiles for your own personal practice floor space in the home or for use in an event shared by many people, you are sure to love our dance floor tiles. Practicing beginners ballet or tap in the home, or if for use a ballroom type environment or flamenco style dancing, these dance tiles are perfectly suitable for multiple dance styles. How are the "Portable Practice Dance Tiles" different from the "Modular Grid-Loc Tiles" ? The main difference between the Practise Dance Tiles and the Modular Grid-Loc Tiles is that there are more colors available with the Modular Grid-Loc Tiles. Can these tiles go on top of carpet, or should they be placed on a hard surface? The dance tiles will function best over a flat, solid surface. High pile, residential carpet can cause the tiles to not lay flat and the interlocks to not interlock. You can put plywood down between the carpet and dance subfloor for a solid surface. I put together a small area of tiles so that I can work on tap at home. Putting up mirrors next in my spare room so that I really have a full space for my love of dance. The tiles were easy to put together and I like that there were options for colors. I was able to create my own design using all wood then a border of white. This was a great upgrade for our adult dance class. Our studio feels much more legit now that we have a real dance floor and for an affordable cost. Loved how easy it is to put this floor together. Very DIY friendly!